Valentine's Day is special at our house. We usually don't purchase gifts, but we do try to spend quality time with each other. Not only do my hubby and I try to fit in a nice dinner, we also try to have a fun dinner with our kiddos too. Lately, we have been trying to make sure that we do special things with each one of our kids. They really enjoy the one-on-one time with Mommy or Daddy. In light of this, I decided that this year we would give Valentine coupons. These coupons are a great way to show your child that you not only love them, but you love to spend time with them too! 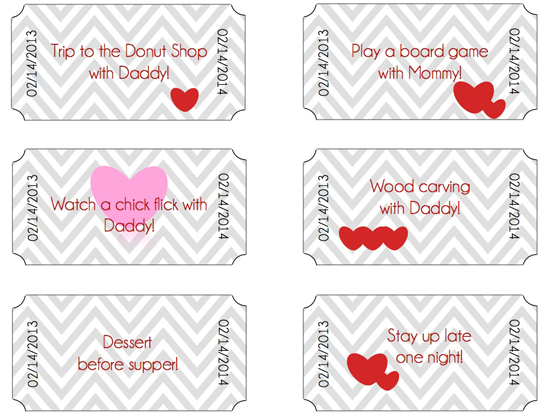 My coupons were based on 4 categories: special time with Daddy, with Mommy, as a family, and a special privilege. 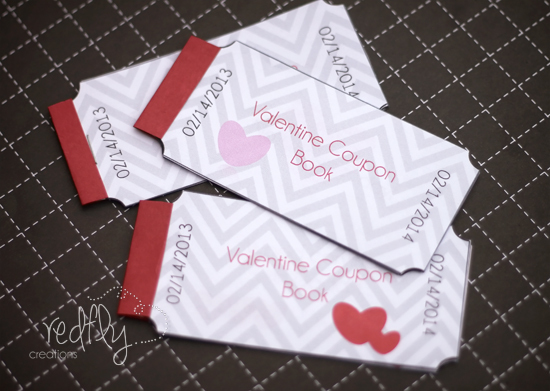 Each child gets a total of four coupons. I tried to think of items specific to each child. These coupon books were very easy to assemble. Simply print out the coupons, cut them out, and staple them together. I did leave about 1/8" on the front end of each coupon. Once I stapled them all together I covered that area with a little piece of red card stock. NOTE: The download also includes blank templates for those who would like to write their own ideas on the cards. This is a precious idea! Thanks for doing all of the work for the rest of us!! Such a sweet Idea!! Just updated Carrie! You should see it in red- Download 2014 coupons here.